In the run up to Father's Day I will be bringing you a few posts with gift suggestions for your little people to treat their daddies with. Gumigem, who make and sell fantastic teething jewellery for mums, also have a range of teething dog tags for dads and I'm delighted to be able to offer a set for one of my lucky readers. 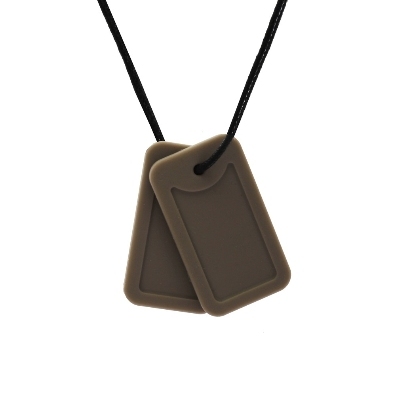 The Gumigem dog tags are available in five different colours - Commander (black), Marine (blue), Trooper (grey), Covert (khaki - as pictured) and even GI Jane (bright pink and great for mums who might fancy a different look). The dog tags are supplied on a long cotton cord with a breakaway clasp.It is possible to cut down the length of the cord and re-tie the clasp to your preferred length. They are available on the Gumigem website where they currently retail for £12:95. I have one set of the pictured dog tags to give away to one of my readers. To enter please complete the Rafflecopter below.